The Rome Motor Show of 1929 saw the presentation of the Alfa Romeo 6C 1750, a model offered as in the case of the 1500, with single or twin overhead camshafts and with or without a supercharger. The engine's vital statistics were thoroughly revised to increase the displacement to 1752 cc, curiously well below the two-litre limit for the class. The car featured a top speed of 95 mph, a chassis designed to flex and undulate over wavy surfaces, as well as sensitive geared-up steering. With the 6C 1750, Alfa Romeo began to supply complete cars, bodied in the Portello factory. The "Super Sport" model, with a shortened wheelbase of 2745 mm like that of the later "Gran Sport", made its debut in the 1929 MM with Campari securing his second win. Base model had a single overhead cam; Super Sport and Gran Sport versions had double overhead cam engine (DOHC). The 6C 1750 won fame in numerous races. Its powerful super-charged is one of the greatest creations of automobile designer Vittorio Jano. The 6C 1750 was produced in six series and became more sophisticated from 1929 to 1933. In total, about 2500 cars were completed. Available in several configurations, most cars were sold as rolling chassis and bodied by coachbuilders such as Zagato, Carrozzeria Touring and James Young. In total, over 250 Gran Sports were made. Chassis 6C10814395 is one of 106 fifth-series Gran Sports produced and one of only two still existing Carrozzeria Brianza coachwork spider left (overall six Brianza GS were build). 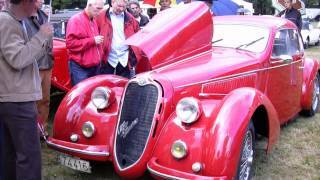 The Carrozzeria Brianza was founded in 1930 and mostly worked for Alfa Romeo, Lancia and Maserati until 1938. In 1932 the firm of Ugo Zagato S.A. was in financial straights and a series of transactions left Zagato temporarily out of business. He went to work as a consultant for the Carrozzeria Brianza until 1935.